There’s a lot of arrogance in our discourse today. Everyone has an opinion and they endeavor to yell it louder than the next guy’s opinion. There’s so much yelling, screaming, and arrogant bluster, my ears are tired. 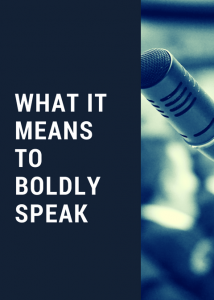 Several times the New Testament says God’s Word should be spoken with boldness. 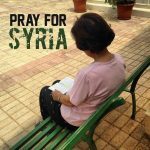 For instance, Paul asked the Ephesian church to pray for him that he “might speak boldly as I ought to speak” (Ephesians 3:20). “Speaking with boldness” makes me think of today’s bullies out there yelling and making sure everyone hears their opinion. Surely that can’t be what the New Testament is talking about! Boldness is not arrogance. Speaking God’s Word boldly does not mean I have to partake in the yelling and screaming. There are three Greek words used in the New Testament that can be translated boldness. The first word means confident action. There are hard things to do, but you get the nerve to do it, and let it rip! No yelling here, just doing the right thing because it’s the right thing to do. The second word has to do with your thinking and refers to a confident attitude. Certainly the world can get you beat and you lose your nerve. But God’s words of life and His precious promises can give us the confident attitude to persevere and spread the Good News. The third word is the one used most often. It specifically has to do with boldness of speech. This word literally means plainness of speech, without ambiguity or figures of speech. Paul pulls these ideas together in 2 Corinthians 3:12, “seeing then that we have such hope, we use great plainness of speech.” The word plainness is the same Greek word translated elsewhere as boldness! We’ve all heard politicians “answer” questions without ever answering the question asked! They beat around so many bushes you forgot what the original question was. Politicians can’t boldly speak the truth because they want to get re-elected! They are playing a political game. Speaking the Gospel is not a matter of winning elections! Speaking the Gospel is about plainly telling people the sinful state they and our world are in. We clearly explain the sacrifice of Jesus Christ, who bore our sins in His own body on the cross. We come right out and tell people that they need to be born again. We can tell them that the resurrection of Jesus Christ is our guarantee that God has the power to raise us up to new spiritual life. Boldness of speech doesn’t mean yelling and screaming, grabbing the bully pulpit from the other guys, and beating everyone into intellectual submission. Nope, speaking boldly has to do with simply telling people the truth. No games, no tricks, no fear, just a simple, straightforward telling of the truth. Speaking boldly means speaking plainly. Go speak the Word with boldness! Pray for opportunities to share God’s Word with those around you. Pray for the right attitude in word and action as we share God’s Word. Pray for self-control to not get sucked into the world’s games of yelling, name calling, and belittling others who disagree. Pray for the Spirit to instruct you in God’s Word so you will be ready always to give an answer for the hope that is in you!